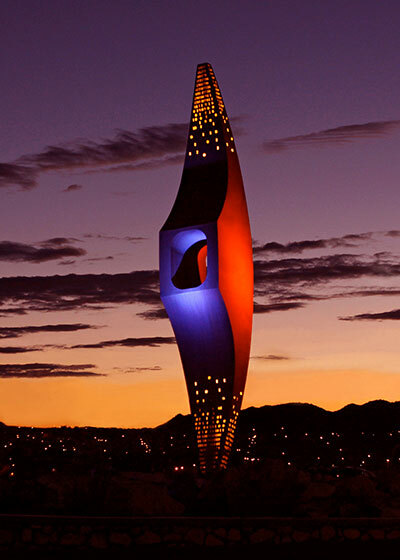 The University of Texas at El Paso will illuminate the "Mining Minds" pickaxe sculpture at the campus' University Avenue roundabout in blue and orange Tuesday evening, April 16, 2019, to commemorate the establishment of the School of Mines, now UTEP. Texas Gov. O.B. Colquitt signed Senate Bill 183 on April 16, 1913, to create the Texas State School of Mines and Metallurgy. The University of Texas Board of Regents formally established the school 12 days later. This new school filled a huge need in the mining industry. Community members pledged $50,000, or almost $1.3 million in 2019 dollars, to purchase three buildings on 22 acres of land that was the defunct El Paso Military Institute just east of Fort Bliss. The school opened on Sept. 28, 1914, with 27 students. The school and the community have enjoyed a long, close relationship. “Mining Minds” is an iconic piece of public art installed in 2010 to enhance the UTEP campus. At night, orange lights illuminate the steel structure while light from LEDs emanate from the perforated “ones” and “zeroes” at each end of the pick. The University illuminates the pick in blue and orange on special occasions such as historic dates, major annual milestones and celebrations of special accomplishments. Learn more about “Mining Minds” at miningminds.utep.edu.